Following the Tower, The Star card is the calm after the storm. Visually we see a purified soul washing away the remaining dark matter so that the ladder to the stars is visible in the sky. 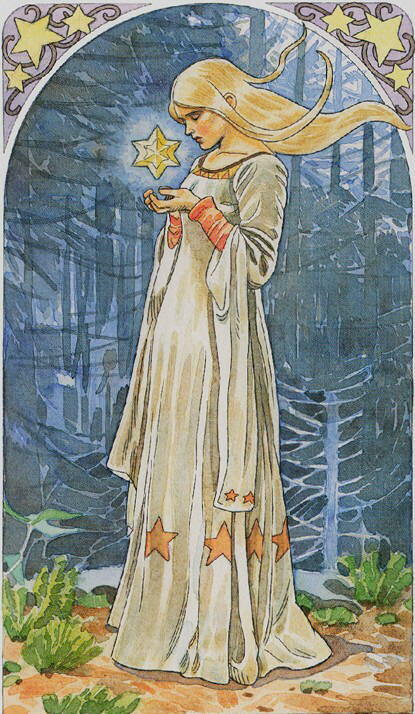 Similiar to Temperance, this figure straddles both land and water, again representing the connection between the inner and outer world, however the stage is more complete in this card. This is a time to ascend to a higher state. The Star represents a breakthrough, an opportunity suddenly becoming available. This moment is like forgiveness after an argument or clarity after disillusionment. Below you can view the various artistic interpretations of the The Star card. The Star lands in paradise! It�s the experience of falling in love. This is the eight-pointed star you�ve been seeking. Being able to see your true self, naked, in all your beauty; nothing to hide. The shell has burst open and your essential self is free! like a flower unfurling, petal and leaf. The stars describe your progress through the holy work. A five-pointed star, single point up, is bright with cultivated human intelligence. The six-pointed star represents the union of the human self with the divine self. The eight-pointed star is a perfected human with fully developed potential. The Star means it�s time to reveal your authentic self. A clone or copy of someone else has no value. Rise and inhabit your day like a queen. Polish each moment like a fine jewel and fill your life with treasures. Open it like a dry sponge and fill your being with joy. Can you be yourself under any circumstances? Have you fallen in love with your essential self? Can you allow your true inner beauty to shine forth?